There are thousands of things to see in Salzburg. I would like to present the highlights you must not miss. Many sights worth seeing, e.g. the 15 m high Residenzbrunnen (residence fountain) are passed en route. All of Salzburg's sights can be visited on foot; When you arrive by train, I advise following order: From the main station walk through the Mirabellpark, then stride along the Northern bank of the river Salzach up to the Kapuzinerberg. Ascend the short way to the Kapuzinerkloster (Capuchin convent) and you are rewarded with a magnificent view of Salzburg and the fortress Hohensalzburg on the opposite site. Alone the fortress Hohensalzburg offers so much to see that I dedicated a separate chapter to that sight. Also the old town has so many buildings and churches that I could write several pages about it. 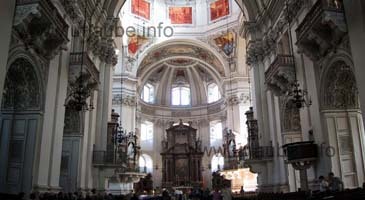 Visiting the Salzburg Cathedral is absolutely compulsory when visiting this town. Already the view from the forecourt on the three-storey front of this glorious Cathedral is fascinating. In the forecourt, you find the Mariensäule, a column symbolising the triumph of the church over the powers of evil. 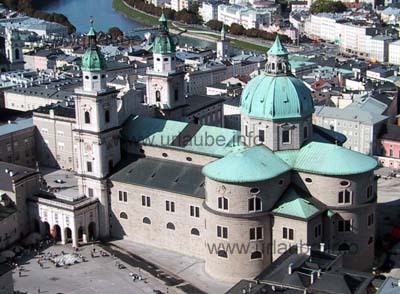 Salzburg Cathedral was first built in the 8th century. Today we find the third building on this site. 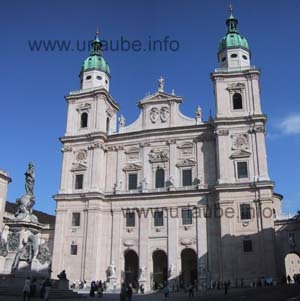 The original Cathedral has been newly built and enlarged in the 12th centuy. By the end of the 16th century, this second Cathedral was severely damaged by a fire and has been re-erected in its current shape in the 17th century. The Cathedral is one of the biggest in the world, 86 m long and 62 m wide; Nearly 10.000 people fit into its huge nave; Art treasure can be found everywhere inside. 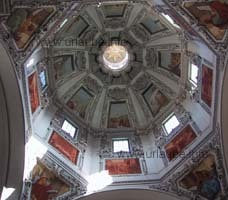 The dome with its 71 m in height is most impressing and its interior is painted with scenes from the Old Testament. Hundreds of pictures can also be found in the middle nave and in the side areas of the cathedral. As it should be, the church has an organ at the rear gallery. And as if that was not enough, there are 4 more organs at the four columns under the main dome. The left side of the crossing (a crossing is the intersection between the middle nave and the transepts) leads down into the crypt where all archbishops of Salzburg are laid to rest. Visitors are allowed to enter a small part of the crypt which contains information about the construction and the history of the Cathedral. The Cathedral radiates in all its splendour and glory. Each little piece of art is worth seeing and whereever you look, you find art treasures and special objects of value. The baptistry on the left side of the entrance is also fascinating. This huge font was crafted in the first half of the 14th century. There is no entry fee to be paid, but visitors are asked to leave an offering when leaving the Cathedral. Some people say that the most strenuous part of a visit to Salzburg is the arduous walk up the castle. But I think that walking along the Getreidegasse is far more exhausting. 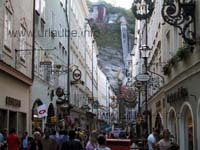 This narrow lane is the most important shopping promenade of Mozart's town. Every day, tens of thousands of tourists stroll through this famous lane which measures 10 metres at its widest and only a few metres at its most narrow spot. There are numerous shops, from modern boutiques over local and "American" restaurants to year-round Christmas shops and Easter-egg stores. The most impressive detail in the Getreidegasse are its many wrought-iron name plates which are attached approx. 3-5 m above each shop. In former times, artisans lived in this street and proffered their goods and services. The probably most well-known spot in the Getreidegasse is the house with the number 9. This is where the most famous son of this town, Wolfgang Amadeus Mozart, was born on the 27th of January 1756. There is an exhibition of Mozart's works and music, his musical instruments and documents of the Mozart family in the Mozarthaus. And of course there is also a large number of shops selling the world-famous Mozart-Kugeln (rum truffles with marzipan) and Mozart-Taler (chocolate filled with praline paste in a coin form). At the end of the Getreidegasse you reach the Old Market. By that time you are surely glad that no more people bump into you and you can catch some breath; Right in the middle of the Old Market, there is an octagonal fountain with the statue of St. Florian. One of the most beautiful, yet not well-known spots in Salzburg is the Mirabell-Garten. This elaborate and lovingly laid out park is a treat for the eyes of every garden- and botany lover. You find formidable shapes cut into ornamental shrubs, beautifully designed flowerbeds, wells with water fountains and generosly laid out park areas. The most cosy part is the hedgerow garden which was laid out according to a French design in the year 1717. Its numerous banks do not only invite tourists to sit down, but it is also a meeting point for many local pensioners walking their dogs. You have a magnificent view of the fortress Hohensalzburg from the Mirabell-Garten. It is very fascinating to see a beautiful setting of gardens, magnificent buildings and fountains and the fortress in the background. On the left hand, you find the former summer residence Mirabell. Unfortunately, this building has been nearly completely destroyed in a huge fire at the beginning of the 19th century and therefore there is hardly much left from the original building today. Schloss Mirabell is the official residence of the mayor of Salzburg. The most famous and room is the original Marmorsaal. A large number of bridal couples from all over the world have their wedding photgraph taken here. For any Japanese who travels from Berlin to Budapest and just stops over in Salzburg, that was just about it: the fortress Hohensalzburg, der Cathedral, the Getreidegasse, the Mozarthaus and the Mirabellgarten. There is not much more to see in only half a day. 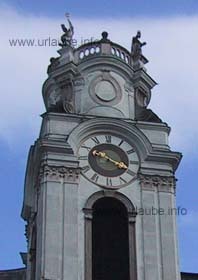 But if you have more time to spare or even spend your holidays in Saltzburg, then you will find a vast number of sights, so many it would fill up a tour book. For example the Residenz (residence) with its glorious halls, the Residenzplatz (residence square) and the Residenzbrunnen (residence fountain). 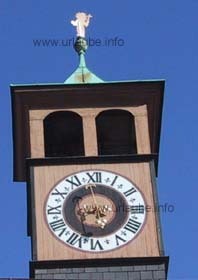 The Michaelskirche and the Church St. Erhard are also worth a visit. And of course you should also see the collegiate church St. Peter which was built in the 12th century. 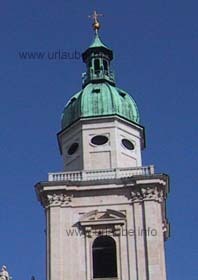 And there is also the Universitätsplatz (university square) with its church you should not miss. And so many more beautiful churches could be added to that list of sights. And there is still the Kapuzinerkloster (Capuchin monastery) with its viewing platform over the Old Town and the fortress. And even if you visited all historic buildings and churches of the town, you still have not been to any museum, except the Mozarthaus. And don't forget the vicinity, the magnificent mountains, the picturesque mountain lakes, also on the German side; Even if many people only come to Salzburg for a day, it is still worth a whole holiday.